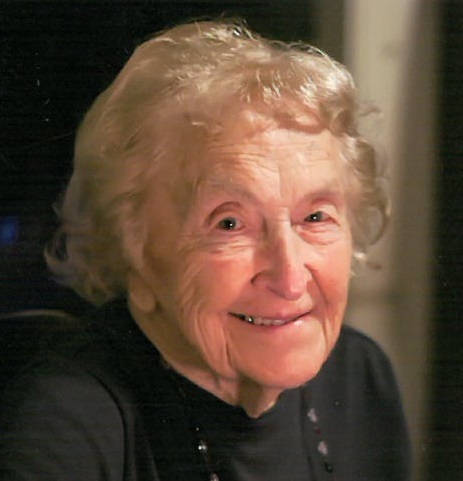 Alde (Cibulsky) Vishnoski, 98, of Sherborn, MA, formerly of North Providence, passed away peacefully on Monday, February 4, 2019, at the home of her daughter and son-in-law, with whom she made her home for the past 5 years. She was the beloved wife of the late Joseph P. Vishnoski. Born in Providence, she was the daughter of the late Stephen and Anna (Zebleckas) Cibulsky. Alde was an accomplished seamstress, who took pride in making quilts and tailored fashions for special life occasions for family and friends. She loved tending to her flower beds, decorating the cakes which she made, and traveling. She always looked forward to watching the Patriots play football. She was a life member of the Marieville PTA, and a parishioner of the former St. Casmir’s Church in Providence. She is survived by her daughter Joan Parenti and her husband, Dan, two grandchildren, Stephanie Deshpande and Daniel Parenti; one great-granddaughter Veronica Aranda, daughter-in-law Hoa Vishnoski, and her nieces and nephews. She was also the mother of the late Joseph P. Vishnoski Jr, grandmother of the late Kim Vishnoski, and sister of the late Albinas and Alphonse Cibulsky. Visitation hours will be held on Friday morning from 9 to 10:15 am, in the Russell J. Boyle & Son Funeral Home, 331 Smith Street, Providence. A Mass of Christian Burial will be celebrated at 11:00 am in the Church of the Presentation of the Blessed Virgin Mary, 1081 Mineral Spring Avenue, North Providence. Burial will follow in Saint Francis Cemetery, Pawtucket. In lieu of flowers, donations may be made in Alde’s name to: St. Jude Children’s Research Hospital, 501 St. Jude Pl., Memphis, TN, 38105.